Linking this post up with Kiki! The story of where my blog name came from is actually not that interesting, but I'm going to Jedi mind trick you into forgetting I just told you that. Four years ago, I started this blog, but it was under a different name: Breathing in the Wind. It's surprisingly hard to come up with a name for a blog, and I spent at least ten minutes brainstorming ideas. That was a joke. Actually I spent twenty minutes on it. 1) I had recently moved to Oklahoma, which is windy. 2) I am alive, thus I breathe. 3) I often go outside and therefore breathe into the wind in order to stay alive (see #2). Then, in fall 2012, I had to choose a team name for the annual Reese Fantasy Football League. After approximately 3.8 seconds of thought, I typed in The Lady Okie as my team name because the majority of the other teams were run by my guy cousins who live in Illinois, and I wanted to distinguish both myself as a female and also an Oklahoma dweller. I bought the domain for theladyokieblog a week later. It was perfect! It was short and required no explanation, which were my two main goals. Since that time, I've come to realize just how truly brilliant my blog name is. It's not only a name for a blog but a name for ME. I unknowingly branded myself as THE Lady Okie. Soon I will be like those famous people who change their name, and no one remembers what their original name even was! I'm talking to you, Vanilla Ice, aka Robert Matthew Van Winkle. If my 400 followers in 4 years is any indication, I'm going to be famous real soon. Watch out. Have you changed or would you ever change your blog name? 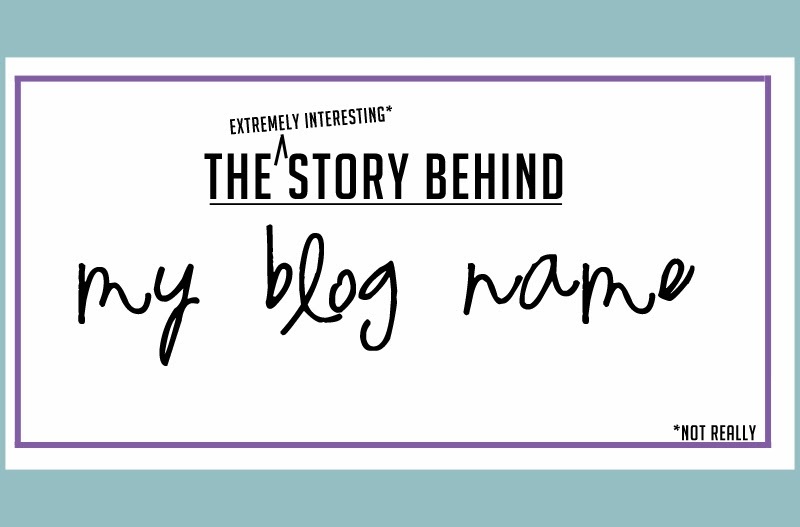 Does your blog name have a story? Love it. It's original and it doesn't sound like it's trying to hard…you know how some names sound like that? How awesome! It's funny how we can sometimes almost overthink things and miss ideas that are just perfectly us! It's always interesting learning how people come up with their blog names! I've thought of changing mine but to be honest, it seems like too much work. I love my blog name, I just don't like that people can never pronounce our last name. haha. should i start call you The Lady Okie from now on? love this story. name is a tricky game isn't it. i changed my blog name twice and the one i used now i think is the most fitting. i don't think i will change it again in the future, but hey, who knows? My favorite part is how regal it sounds when I refer to you (and I do...usually when filling Riley in on one of your recent posts...) as The Lady Okie. You know, like Lord and Lady Okie, haha. It's quite nice, right? HA! That was cute. I love hearin' how people get their blog names. Mine is By Breenah because everything on the blog is BY me. The end. Although, Breenah has a slightly longer origin story. The first kind of group I was with online (shoutout to AMA on LJ) already had a Sabrina. They already had a Brina. So I figured I'd be Breenah, which is just Brina spelled differently. I'm not super in love with the spelling anymore, but it's what the internet knows me as so it's staying. For now. My blog is called Written In Blue. There really isn't much of a story behind it. I just thought it suited me. I will admit that I spent well over 20 minutes brainstorming name ideas. I actually spent a few days thinking on it, to be honest. I like your blog name tons and it always makes me think of Annie Oakley for some reason and so in my mind! i always think of Annie Oakley too!!!! Great name and great story! For my blog, Change is My Only Constant was chosen, because when I started it, there was a whole lot of change going on in my life. I left my ex-husband and was getting a divorce, I had a major change in careers, and I was finding myself. It's been rather fitting so far! haha, I love your description of the progression of how you got your blog name! I don't think I'll ever change my blog name...primarily because I hate doing the whole domain name redirect computer-ish stuff. Even your "boring" stories (I didn't hear that from you...) manage to be highly amusing. I loved this! I can't wait until the day I get to say "I knew her when..." I'll be so proud. I love the name, and it's definitely more memorable than your initial idea! Love the name and story ... great stuff (found you from T-Rex)! My blog I did when Blogger launched (in 1999) was called 'Cognitive Dissonance' and was an outlet since I was writing for other places. But when I wanted to focus more on a personal blog last year, it didn't make sense, so I created a new one - and since I was a veteran runner who'd never run a race, it was a change of course for me - this 'Running Around the Bend'. Love the story! I love my blog name and don't think I will ever change it. It was how I used to sign off my letters when writing to soldiers over seas. It started out as Stay Safe, Smile Often and then to Till Then Smile Often. If fits with who I am and my nickname of Smiley. A name is really hard to come up with, but that one just fit. I like it. :) It reminds me of my blog name and how I came up with it in about 2.5 seconds on some random day. I'm not creative at all so lightbulb moments are the best in my brain. Names such as The Lady Okie and A Desert Girl are pretty timeless and won't need to be changed for different decades and phases of life. I like that. such a fun post - you make quirky post about a blog name as interesting as a mindy kaling novel - rare talent. have you thought about writing books? or have you talked about that before? I love your blog name! I ended up changing mine last year after we got married to something that was more of our life and not just mine. It was Daily Chaos of a Country Girl From Ohio (take a breather - it was way too long!) but I never really loved that name. It took me a good couple of days contemplating what I would change it to. Probably one of the harder decisions I have had to make. I love your blog name too! I think it's fantastic! I've been reading your blog since you were Breathing in the Wind! I don't know when you changed the name. Wow! Has it really been that long? Crazy! Ah I love this! Also I'm amazingly jealous that your blog name came to you on a whim. I've racked my brain for hours and come up with NOTHING original to name a blog. I think it's one of the most difficult aspects of starting a blog. I love "The Lady Okie" though - so perfect! p.s. you are The Lady Oakie to me. not really sure why I spelled "okie" wrong TWICE. sorry. This is HILARIOUS. It's a great blog name, but the story behind it actually is really good. Your Jedi Mind tricks worked! And I also love that it's a part of your identity, too. p.s. Like Brita said, your Jedi mind tricks worked! This cracked me up, especially your comments on breathing in the wind. :) I love the name of your blog, and I love that it just came to you. It was meant to be!! Wait... you name isn't Lady Okie? Find your story interesting, I did.